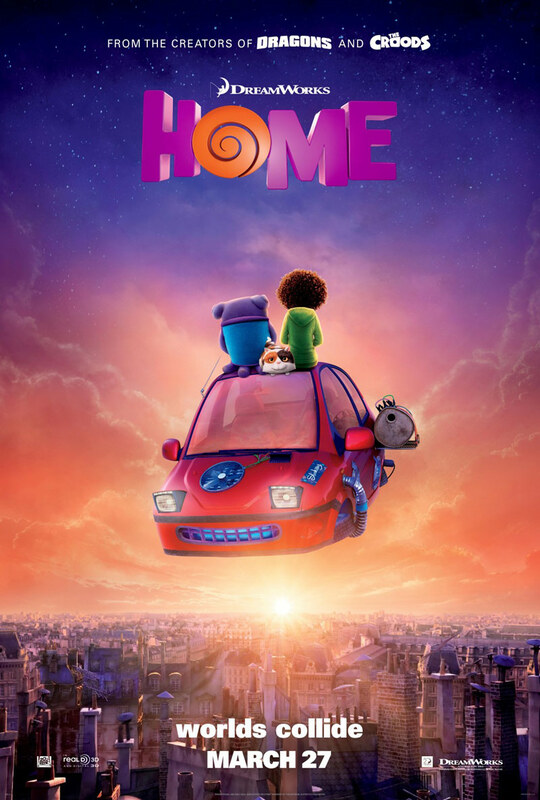 Jim Parsons and Rihanna voice the animated sci-fi adventure Home, based on the book ‘The True Meaning of Smekday’ by Adam Rex. An alien (Parsons) on the run teams up with a teenage girl (Rihanna). When Earth is taken over by the overly-confident Boov, an alien race in search of a new place to call home, all humans are promptly relocated, while all Boov get busy reorganizing the planet. But when one resourceful girl, Tip, (Rihanna, who also contributes a song) manages to avoid capture, she finds herself the accidental accomplice of a banished Boov named Oh (Jim Parsons). The two fugitives realize there’s a lot more at stake than intergalactic relations as they embark on the road trip of a lifetime. Based upon the novel “The True Meaning of Smekday” by Adam Rex.